There are three most important and basic parts needed to make a laser beam: a laser medium, an external energy source, and reflective mirrors. The external energy source stimulates the laser medium in the resonator and creates photons, and the photons are then amplified by reflection between the totally reflective mirror and the partially reflective mirror. When they reach a certain level of energy, the amplified photons are discharged through the partially reflective mirror, and this is called a laser. Laser mediums can be divided into gas, solid-state, liquid, and semiconductor. Gas medium lasers include CO2, Argon, He-Ne, Eximer, and Copper Bromide Lasers, and solid-state medium lasers include Nd: YAG, Alexandrite, Ruby, Er:YAG, and Er: Glass Lasers. Liquid medium lasers include the Dye Laser, and semiconductor medium lasers include the Diode Laser. An example of external energy sources are electrical current or a flash pump, and individual lasers use different energy sources. In case of reflective mirrors, one of them is totally reflective and the other is partially reflective. Therefore, the photons discharged by the external energy sources are amplified between the two reflective mirrors and more photons are created. As was briefly mentioned in the previous issue, lasers have four different characteristics: monochromaticity, coherence, collimation, and high intensity. Monochromaticity means containing a single color (Fig. 2). Lasers use a wide range of wavelengths from ultraviolet to far-infrared rays. Wavelengths refer to the length of the waves and are therefore specified in nanometers. One wavelength has one color. Of course, we can only see colors for the wavelengths that fall within the spectrum visible by human eye, and ultraviolet or infrared rays are not visible. 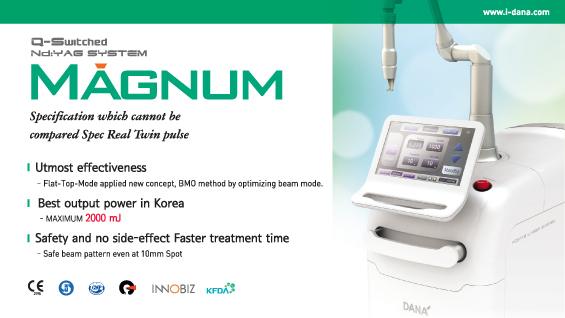 For example, the Eximer laser used for treatment of leukoplakia and psoriasis uses a 308-nm light with a wavelength falling into the UV region, and the Nd: YAG laser used for the purposes of melasma removal and skin regeneration uses a 1064-nm light with the wavelength within the near-infrared ray region. Both are invisible to the human eye, but they bring the required therapeutic results by causing a reaction in tissues. Each laser using a wavelength from the visible light region (400~700 nm) has one of the colors of rainbow, red, orange, yellow, green, blue, indigo, and violet, depending on its wavelength. For example, the 511 nm Yellow Laser appears green, the 578 nm is yellow, the 532 nm KTP Laser is green, the 694 nm Ruby Laser is red, and the 755 nm Alexandrite Laser is red. The reason why monochromaticity in lasers is important is because it is the closest to the chromophore that absorbs the laser. Just as people are born into a specific race, the basic origin of a laser differs based on its wavelength. And since laser wavelengths can have different chromophores, a decision on which chromophore shall be used must be determined first before the wavelength of the laser is decided and applied to skin.